We can create the t-shirt you need easily and quickly. Choose from 8 in-stock colors and options of front, back, and/or pocket printing. Our process is full-color - so photographs look great! We make custom t-shirts easy! 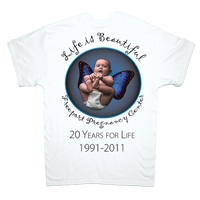 Full-Color at no additional charge, sizes from Infant to XXXL. Prices below are for white shirts but we have lots of color shirts in stock (just add $1.50 to add a color shirt). Due to the printing process all shirt colors are light. Additional imprint side/location adds $1.50 each.